walking into the 101 coffee shop in hollywood is like sticking one foot back in time. the throwback diner filled with modern-day hipsters is modeled to look just like the coffee shops of the 1960s—complete with retro booths, a stone wall, and a long counter lined with bar stools that stretches through the restaurant. as stated on their website, “The menu at 101 Coffee Shop features retro diner fare with a Southern California twist.”…which of course means they have a few vegan options! 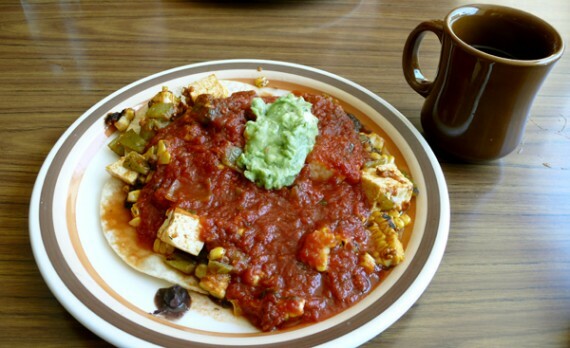 while there isn’t a huge selection for us vegans, the diner does offer a very popular animal-free breakfast item called “no huevos” rancheros. i hit up 101 recently with fellow vegan blogger brittany, from sickoflettuce.com…and although it was well into lunchtime, we both opted for the coffee shop’s signature vegan breakfast dish. 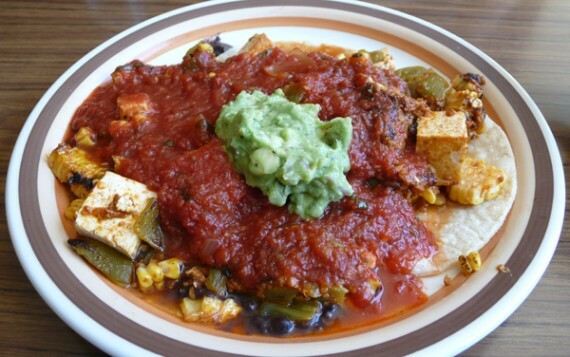 as you can probably tell by the name, the “no huevos” rancheros is an eggless take on huevos rancheros…and comes complete with scrambled tofu, vegan sausage, black beans, corn and ortega chilies atop tortillas, all smothered in ranchero sauce and topped with a dollop of guacamole. i think this dish incredible because it’s chunky, sloppy, spicy, and savory—everything i love all at once. 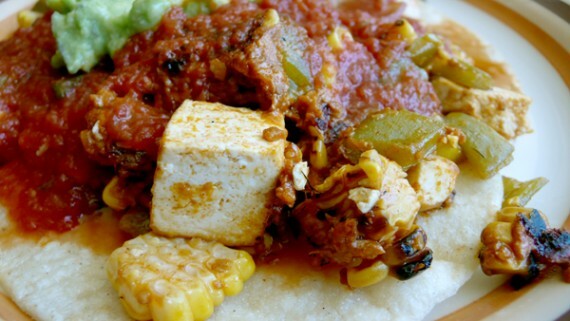 the ranchero sauce is bursting with rich tomato flavor, the tofu is well-seasoned, and the soyrizo is perfectly greasy. mix it all up with the chilies to give it some heat, then cool it down with the guacamole, and you have vegan breakfast bliss at any time of day. brittany and i both loved it, and although 101 has a couple other vegan dishes, i don’t think i could ever see myself straying from the “no huevos” rancheros. 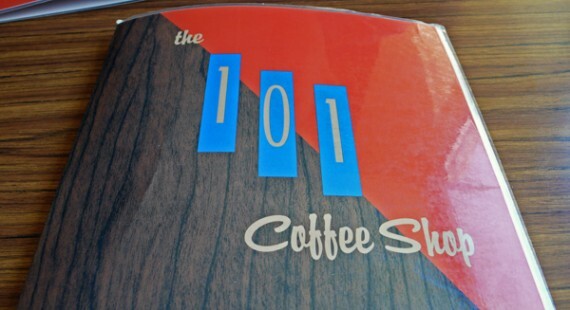 whether you live in los angeles, or are just visiting, i would classify a meal at the 101 coffee shop as a “must”. don’t go just for the food, but for the classic diner vibe and the retro interior. the staff and clientele are all ridiculously cool and beautiful, and the 60’s design is spot on. 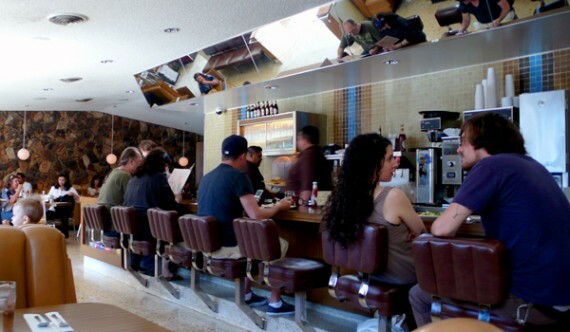 you’ll feel like you’re eating in a time-warp or a quentin tarantino movie…same thing, i suppose. and how great is it that a place like this ALSO caters to vegans?! go there, and get the “no huevos” rancheros. eat them for breakfast, lunch, or as a late night post bar snack…whenever you have them, they won’t disappoint.